In this week, NBA 2K17 patch was released by 2K, it’s said to that the patch is now available on both the Xbox One as well as PlayStation 4. Regarding its the patch 1.06 notes, let’s take a brief a look, this update addressed majorly gameplay improvements. In particular, there are some fixes made to MyPark ahead of the addition of MyPark’s Park After Dark, which started this weekend. Immediate steals from an inbounds play and back bump dribbles were things addressed inside this title update as 2K tries to get MyPark perfect for its new endeavor. Other gameplay fixes that were affected include increasing the speed in which the CPU get into their offensive sets and running plays. There is no reason for the AI taking 10-15 to get setup, only to force a rushed shot as the shot clock runs down. Besides the fixes mentioned, it seemed that everything else is cosmetic as the look of the game was the key to this recent update. Broadcast stadium cameras were adjusted for the Bucks, Mavericks, Kings and Clippers, while the Hornets received the correct pre- game court projection in this patch. Many other small bug fixes and adjustments were also made, game-wide.A number of performance improvements to solidify the Pro-Am experience. Users can now unequip the skateboard and mascot outfits from their MyPLAYER. Fixed an issue that would cause some users to hang when attempting to hop from one park to another. Begins Park After Dark Fixed a MyTEAM Challenge case where the in-game overlay would claim the challenge was not successfully completed when it actually was. Addressed a case where a MyTEAM card that was sent to the Auction House could still appear in lineup menu as being available (when it actually wasn’t). Made some aggressive bump back dribble collisions MyPARK only. Sped up the CPU’s ability to get into its offensive sets and run plays. Updated Broadcast Stadium cameras for Bucks, Mavericks, Kings, and Clippers. Fixed an issue where pass icons were not appearing for users playing in 4K on the PS4 Pro. Cleaned up an issue that lead to unrealistic speed bursts in some size-up escape and combo moves. Removed some long, drawn out dribble loss (pickup) animations from the body up system to improve responsiveness. Prevent defenders from being able to steal the ball from an inbounder immediately after checking it in when playing in MyPARK. 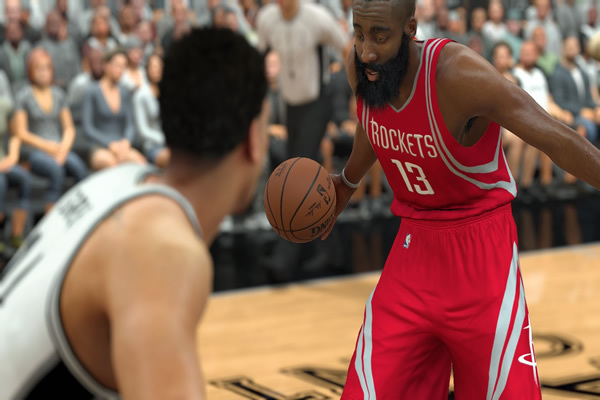 Make sure all players are in position before checking the ball when playing half-court games in MyPARK. Fixed an issue that would sometimes cause CPU-controlled ball handlers to run out of bounds when attacking the baseline. Beluba camera updated to zoom out more in transition and to have a wider range of zoom and height adjustment settings. Fixed a case that caused the wrong dribble move to queue up when attempting to perform driving combo moves (e.g. double crossover). NBA 2K17’ Patch 1.06: Latest Update Adds Visual Improvements, Fixes MyPark As 2K The Hornets will now have their correct court projection during the pre-game presentation. Fixed an indefinite simulating screen that would occur when your MyPLAYER retired after the completion of his 20-year MyCAREER. Addressed an issue in MyGM/MyLEAGUE where a league filled with Classic and Euroleague teams would sometimes hang late in the season when simulating. Fixed a hang that would occur in MyGM/MyLEAGUE when attempting to enter the Staff Signing experience when the team had no Assistant Coach (retired) and an expired Head Coach.